SHAH ALAM: Naza TTDI Sdn Bhd completed its commercial development, the Laman Seri Business Park, 18 months ahead of schedule. The business park boasts 46 exclusive high-end units comprising six blocks of four and five-storey shops and offices. The developer expects a variety of businesses, including three major banks, boutiques, lifestyle spas, fitness centres, popular food and beverage outlets, to occupy the commercial centre. “We are pleased to once again maintain our track record of delivering our prduct ahead of schedule,” said group managing director S.M. Faliq S.M. Nasimuddin in a statement in conjunction with the key handover ceremony yesterday. The business park, launched in March last year, was developed to create a conducive place for people to work and meet within an environment-friendly setting. This is manifested in the generous provision of public spaces, lush green landscaping completed with synchronised fountains and water-scape and koi pond, wide footpaths and five-foot ways and public utilities. SUBANG: UEM Land Holdings Bhd has a slew of property launches for 2010, primarily within the Nusajaya (Johor) and Klang Valley areas, said managing director and chief executive officer Wan Abdullah Wan Ibrahim. “We have many more projects in Johor and we hope to seal some deals in Kuala Lumpur and Selangor. “In Nusajaya, we have a lot more on our plate,” he told StarBiz after a signing ceremony yesterday with REAL Education Group Sdn Bhd, an education services provider. Wan Abdullah said the projects in the pipeline comprised affordable, medium and high-end developments. He was also optimistic about UEM Land’s business prospects for 2010. “Looking at our results (for the financial year ending Dec 31, 2009), we suffered in the first quarter, recovered in the second and improved in the third. “The fact that our results are improving consistently tells you that we are on the right path,” Wan Abdullah said, adding that the launches it had slated for next year would boost the company’s performance. UEM Land’s net profit for the third quarter ended Sept 30 surged to RM7.54mil from RM1.11mil in the previous corresponding period despite revenue dipping to RM72.79mil from RM78.37mil previously. The company yesterday signed a sale and purchase agreement with REAL for the latter’s purchase of 0.4ha of land to establish a kindergarten in East Ledang, Nusajaya. REAL group chief executive officer Sim Quan Seng said the land and the construction of the kindergarten could cost as much as RM4mil. A residential enclave set amidst gardens and ornamental waterways in an area spanning 110ha, East Ledang will be developed in seven phases with a gross development value of RM1.4bil. Nusajaya, spanning 9,550ha, is slated to become one of the largest and most prestigious integrated urban developments in South-East Asia. Wan Abdullah said UEM Land was in talks with parties to develop projects in Nusajaya. “We are always on the search for strategic partners. Because of the size of Nusajaya, it is impossible for us to develop projects ourselves. In most instances, it would be a joint-venture initiative,” he said. Property developer SP Setia Bhd has expanded its Penang landbank with the purchase of two plots of land on the island which are being earmarked for residential development. SP Setia property division (north) general manager S. Rajoo said two parcels of land - one in Sg Ara and the other in the affluent Jesselton neighbourhood - have been acquired for a total of RM87 million. The Sg Ara plot, totalling 12ha, is made up of half hill and half level ground, is being planned for a mixed development project of terraced houses, semi-detached units, bungalows and condominiums. "We have also acquired slightly more than 0.8ha of land right next to the Penang Turf Club along Jalan Brook for RM24 million," Rajoo told Business Times. He said low-density high-end bungalows are being planned in the prestigious neighbourhood and the company plans to build 11 low-density bungalows which are priced at RM5 million each. "We are also actively talking to landowners to enter into either joint-ventures or outright purchase of their land," Rajoo added. SP Setia's maiden entry into Penang more than three years ago was via the Setia Pearl Island development which is sprawled on a 45ha site and carries a development value of RM1.2 billion. To be developed over the next five to six years, the project comprises three-storey terraced homes, semi-detached units and commercial lots, and is located between 4km and 5km from the proposed site of the second Penang bridge at Batu Maung, 10km from the Penang Bridge and 20km from George Town. To provide industry players a platform to showcase their developments, The Star Media Group will be organising the first Star Property Fair in Kuala Lumpur from Nov 27 to 29. Themed Stylish Living, the fair will be held at the KL Convention Centre Halls 4 and 5, where visitors get to view the latest offerings by renowned local developers from medium to high-range residences, bungalows, condominiums and commercial projects. Taking centre stage throughout the three-day event is the Star Property Fair VIP Lounge by Kenny Heights. Kenny Heights is a project developed by KH Land Sdn Bhd, which is a subsidiary of Dutaland Berhad. Kenny Heights head of marketing Jennifer Chow said Kenny Heights is an 35.7ha integrated mid-town development around the neighbourhoods of Sri Hartamas, Mont Kiara, Damansara Heights and Kenny Hills, targeted at affluent home owners and investors. “This entire development comprises nine parcels to be developed over 15 years,” said Chow during an interview at Menara Star. She said the VIP Lounge, to be set up between Hall 4 and 5, would showcase the living lounge of the first Conran branded residence in Asia via its Kenny Heights Sanctuary condominiums, whereby the first tower of Phase One would be soft launched at the fair. Chow said she hoped the VIP Lounge would enable people to experience what Kenny Heights aspired for in its developments, which is about quality of life and where breathing space is emphasised. She said while guests were mostly by-invitation, the walk-in public needed only to register with the counter in order get their access into the Lounge. 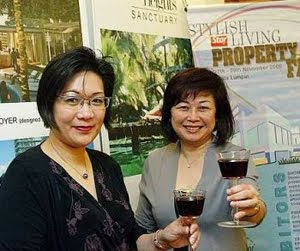 Star Publications (M) Bhd marketing services general manager Iris Tan said: This is the first time The Star is organising the property fair in Kuala Lumpur, having organised past annual fairs in Penang for the last eight years. “We hope this will allow property developers and prospective buyers to conveniently meet and shop under one roof. A number of banks and insurance companies have also confirmed their participation,” said Tan. She hoped the property sector would support the fair as this was an event for them. Other highlights are auctions by CIMB Property Mart and a contest for visitors to the fair with prizes worth over RM20,000 to be won. Housing and Local Government Minister Datuk Seri Kong Cho Ha is expected to launch the fair. The fair is open from 11am to 8pm and admission is free. For enquiries, call Kenny Thong or Ian Qua at 03-7967 1692 ext 1165.